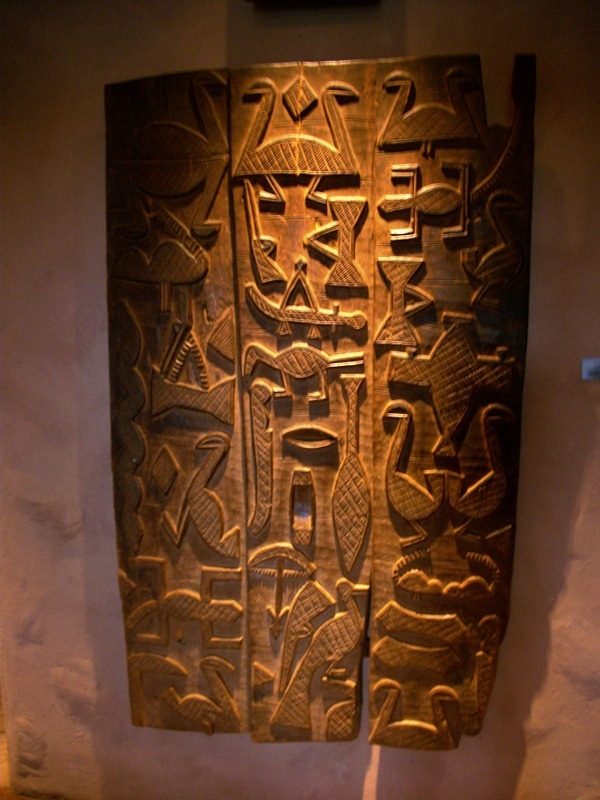 Positioned between the sliding doors at the entrance of Disney’s Animal Kingdom Lodge, this may seem like just another exquisite piece of art in the resort’s collection, but there is so much to gleam from this exhibit. This carving is, in fact, a door which makes its placement in the resort a perfect spot. 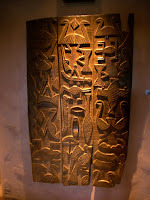 The joined planks of this door have been chip carved by the Nupe people. The Nupe reside at the convergence of the Niger and Kaduna rivers in Nigeria, where they make their living fishing and trading. They are, as well, highly skilled artisans, working with everything from metal to beads in forms including weaving, carving, and embroidery. As you predicted, Ryan, this door will never be painted black...or any other color for that matter. Thanks for pointing it out. Got this photo on our last visit. I think we stayed there 2-3 times prior and never stopped to read the plaque. Very neat.